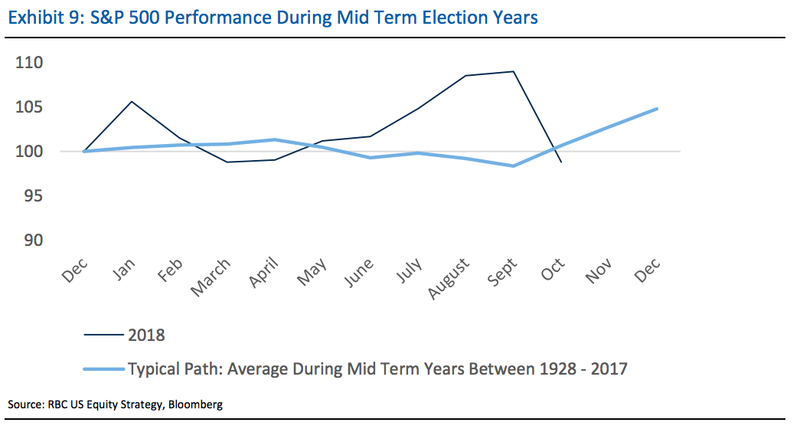 Stock market activity in the run-up to the November 6 midterm elections has defied historical patterns. What happens after could also be unexpected. The results could have major implications for policies like tax reform, which have fueled investor gains this year. We’ve compiled an investing guide for the midterm elections using recommendations from some of Wall Street’s top strategists. „Accordingly, to the extent that the typical 8% S&P 500 rally during 4Q of midterm election years — twice the median return of 4% in other years — is driven by declining uncertainty, that pattern may be less likely to repeat this year,“ he wrote in a recent client note. „The stock market tends to like gridlock better because it takes away the extremes and does not disrupt the status quo,“ Lynch said in a note. He added that if you believe the GOP’s biggest policy achievement has been tax cuts — and it arguably has been — a gridlocked Congress that changes little should not be a big market mover. „Continued Republican control could mean more stimulus, which should bear flatten the curve, tightening swap spreads and widening TIPS breakevens,“ said Michael Hanson, the head of global macro strategy at TD Securities. Investors can peer into Goldman Sachs‘ basket of stocks most exposed to tax reform, which contains companies including Chesapeake Energy, General Motors, and Eli Lilly. Goldman thinks these companies will generate the highest return on invested capital. It refers to this as „growth investment,“ defined as R&D plus capex in excess of depreciation. Investors can expect „extreme gridlock“ and slower regulatory relief, according to Mike Ryan, the chief investment strategist at UBS.